“In the 2015 presidential election, the APC was more prepared for defeat than for victory. The party did not expect to win and clearly had no agenda for victory”. In a 1972 Hollywood film entitled The Candidate, Robert Redford acts as Bill Mckay, a political neophyte who is drafted out of the blue into a race for the U.S. Senate. With no chance whatsoever of winning, Mckay is given a free hand to say whatever he likes on the stump. Therefore, he tweaks the political establishment at every turn. However, as a result of a series of unexpected developments, he keeps rising in the polls. By Election Day, he is neck and neck with his more seasoned opponent and the race goes to the wire. To everyone’s surprise, he pulls off an incredible victory and is elected senator of the United States. The last reel of the film is on the night of his election. On hearing he has won, Mckay becomes flustered and confused. Victory was certainly not part of the plan. As media men gather, eager to get his reaction to his famous victory, he pulls his campaign manager into a room and asks him in consternation: “Marvin, what do we do now?” Before he can answer, the media close in on them, drag them out of the room and the film ends. The satire of the film, which received an Oscar for Best Screenplay of 1972, is that while Mckay might have succeeded in fooling the electorate to vote for him, he did not have a clue what to do as a United States senator. It was all a bit of a joke for him, but then the joke backfired. He never expected to win and had no contingency plan for victory. The Candidate could easily have been a made-in-Nigeria movie in 2015. To all intents and purposes, the opposition APC won an implausible victory against all odds. But in the presidential election, APC was more prepared for defeat than for victory. The party did not expect to win and clearly had no agenda for victory. This is what accounts for the cul-de-sac we now find ourselves in Nigeria. If anything defines our current predicament, it is that we have a government that, in the middle of an economic crisis, does not have a clue what to do. The APC did not plan to govern. The party-members told Nigerians what mayhem they planned to unleash should they lose and what parallel government they would establish. But concerning government, they proffered no solution on how they would address Nigeria’s urgent economic problems. On the contrary, they made wild unrealistic promises that were totally out of kilter with the situation on the ground; promising to do extravagant things that could not even be entertained by previous governments in more buoyant climes. How else can one explain the fact that, in the context of a drastic economic downturn, the APC came out with a “Father Christmas” manifesto, loaded with such pies in the sky as paying unemployed graduates, or giving cash handouts to the poorest 25 million Nigerians? Foolishly, Nigerian voters failed to determine where APC hoped to get the money for such largesse. Because the APC was not prepared to govern, no agreement was reached beforehand by the legacy parties of the coalition about how to distribute the spoils of office. This provided the basis for the free-for-all fights that ensued once the election was over. Because the APC did not expect to govern and was not prepared to govern, it took President Buhari five months to choose his cabinet. Five months of squabbling and in-fighting, while pretending to Nigerians that the delay was needed to find technocratic saints and angels. But the saints and angels turned out to be the same old “devil you know.” While the president dawdled, the economy went from bad to worse and investors voted with their feet; leaving Nigeria in droves. We are now confronted with the fact that there is definitely a technocratic deficit in the president’s new crew. Needing to make up for the time we lost while the president kept everyone waiting, we have now discovered that the people he laboured to choose bring little or nothing to the table in terms of their capacity to address expeditiously the grave issues currently confronting the country. So what do we have now? Nigeria is a sick patient currently lying comatose in a hospital emergency ward. Her condition is critical. A surgical operation is urgently required. However, there is no doctor on duty. The night-nurse only works at the hospital in her spare time. In the daytime, she is the proprietress of a “mama put.” The other nurses are also part-time workers. They are a collection of cooks, tailors and groundnut sellers. This raises grave concerns about the fate of the patient. What is going to happen to Nigeria? If we are not careful, this patient might not make it. When President Buhari finally chose his ministers, he chose by his own account “noise-makers.” These turned out to be economic illiterates. Instead of putting together a coherent economic policy that will stop the free-fall of the naira and encourage monetary inflows to supplement the drastic cuts in our foreign exchange income, the government’s answer has been to do nothing but blame the past administration for everything. Its blueprint, if it has any at all, has been to ignore the economy and concentrate instead on anti-corruption propaganda while the president junkets around the world. Before Lai Mohammed was appointed, Adams Oshiomhole was the self-appointed minister of Information. His job, was to attack Ngozi Okonjo-Iweala, the former minister of Finance, at every turn. This assignment involved re-writing the history of the Jonathan years. 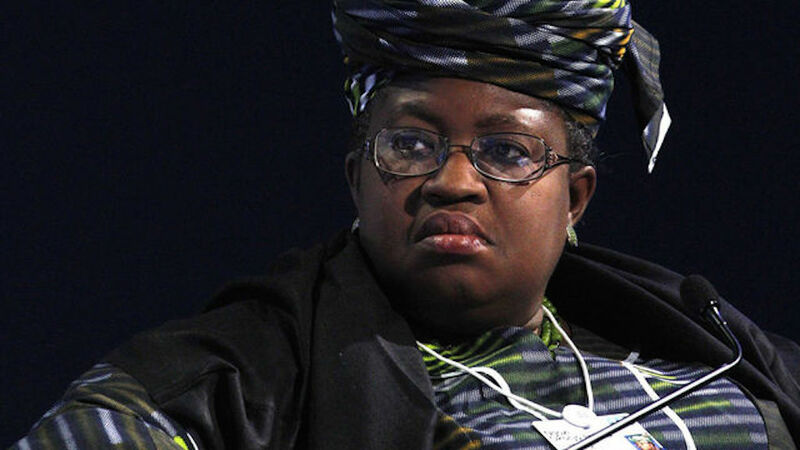 Okonjo-Iweala is a seasoned economist with vast technocratic experience. At one time, she was in the running for President of the World Bank. As minister of Finance, she had an economic blueprint for addressing Nigeria’s economic morass; something sorely lacking in Oshiomhole and his colleagues today. Since leaving office, she has been snatched up as Senior Advisor at Lazard. Okonjo-Iweala stressed the need to reduce Nigeria’s recurrent expenditure. She insisted Nigeria could not afford the petroleum subsidy. She wanted its trillion naira leakages plugged. But Oshiomhole and his former labour union colleagues would have none of that. They mobilised Nigerians against her; so the hemorrhage continued. Okonjo-Iweala wanted Nigeria to save for the rainy day by establishing an excess crude account and a sovereign wealth fund where incomes above budget estimates could be saved. However, Oshiomhole and his governor colleagues would also have none of that. They insisted all extra money earned must be shared and spent and not saved. They even went to court to force the minister’s hand. Now that the national oil cookie has crumbled, the same Oshiomhole and his misguided colleagues are holding Okonjo-Iweala responsible for not building sizeable foreign reserves in times of plenty. However, nothing justifies Okonjo-Iweala’s earlier postures more than Nigeria’s present predicament. Indeed, what Nigeria desperately needs today is Okonjo-Iweala or an Okonjo-Iweala. We need a seasoned and experienced economist to head a team of hard-nosed economists to work out an economic policy to get Nigeria out of the woods. No such team exists today in the Buhari government. Instead of constituting an economic team, the president is appointing social media aides to help launder his image. As a result, the naira is in free-fall and nobody in government seems to know what to do. It is now 400 to the dollar and the president keeps saying he is against devaluation because it will affect the masses. Somebody needs to tell Mr. President that the masses are already adversely affected. Everybody is raising prices, using the free-falling naira as excuse. It is not inconceivable that by this week-end, the naira might be trading on the parallel market at 500 to the dollar. In many respects, Nigeria’s economic situation today is god sent. It enables us to do what we failed to do when the oil market was booming – downsize the government and transform the economy away from oil dependency. However, the tragedy of today is that we are saddled with a government that refuses to face reality. It refuses to entertain the harsh adjustments that need to be made. The first economic blunder of this government was to bailout the states with salary arrears. The bailout did not address the fundamental issue of the insolvency of those states. It just postponed dealing with them. Since the bailouts are not grants but loans, with repayments to be deducted from the monthly allocations of the states, it means even less money will be coming to them now that there is far less money to share. The truth is that most of Nigeria’s states cannot survive without government handouts. Better now than later, we need to re-visit the issue of Nigeria’s unrealistic states structure and face up to the fact that we cannot afford 36 states. Neither can we afford a federal legislature that gobbles up over N100 billion per annum. In addition, we can no longer afford a situation where billions of naira is spent every year just catering to the president. One of the strange things about this government is that it refuses to entertain the need for austerity in the context of our drastically reduced income. Instead, it comes up with a bigger budget than when our economy was far more buoyant. Nigerians refuse to see the 419 in this. If you were earning six naira and your income drops to four naira, you don’t then decide to spend eight naira. This is what the economic illiterates currently running our economy are proposing to do in 2016. The APC refuses to accept that after 16 years in the political wilderness, it has to make do with lean resources now that it is its turn to be at the helm of affairs. Therefore, it decided to pad the 2016 budget by basing it on oil selling at $38 dollars per barrel; when the commodity has already dropped far below $30. It has also decided to pad Nigeria’s reduced income with borrowed money. Sums are allocated for fake items, others are inflated beyond measure. Although civil servants have been made the sacrificial lambs for the budget mess, one wonders if a number of the inflated items were not camouflaged backdoor paybacks for APC’s dubious election campaign expenditures. The hard choices we continue to refuse to make today will still come back to haunt us tomorrow.